Trump Supporters Cheer Quick Starts On Campaign Promises In His First Weeks The Trump presidency's early days have been anything but uneventful. Trump voters in Algonquin, Ill., praise both the pace and content of his actions, from the travel ban to his Supreme Court nominee. 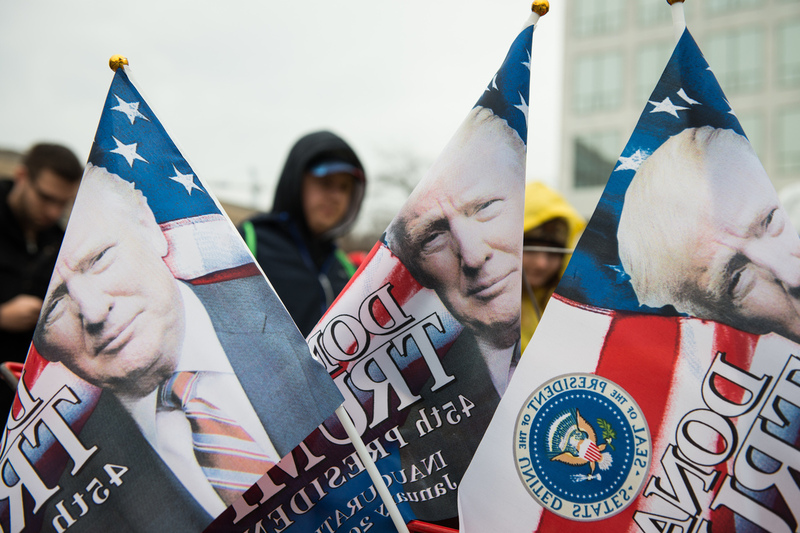 Flags printed with President Trump's face are sold outside one of the entrances to the National Mall in Washington, D.C., on Inauguration Day on Jan. 20. Algonquin, Ill., is a Republican stronghold. The growing town of 28,000 is about an hour's drive northwest of Chicago in McHenry County, the only one of six in the metro area to vote for President Trump. At Short Stacks, a small diner on Main Street, Ginger Underwood sits at a table with her two adult daughters. She voted for Donald Trump and says that, so far, she is glad she did. "I think Trump is doing exactly what he said he was going to do when he ran for office," she says. "So that's fine with me, that he's doing what he's doing." It's been 12 days since Trump was sworn into office and between a flurry of executive actions and his choice for the U.S. Supreme Court, it has been a whirlwind of activity. Underwood, who does volunteer work for a local environmental group, says she has no worries about the pace of executive actions during Trump's first days — and, in fact, likes them all. But she does say she wishes the president would be more, as she says, tactful, when he does things like imposing restrictions on people traveling from seven predominantly Muslim countries. "Not just suddenly doing it with no notice — not surprising his fellow Republicans," she says. Both of Underwood's daughters are independents, and neither voted for Trump. Jessica Underwood, 40, says she's trying to come to terms with the new administration. But the horse trainer says she's not a sore loser. "He won fair and square," she says. "I'm not impressed, but now I feel we have to live with it." Her sister, Dana, 43, is less accepting. "All these decisions affect people's lives," the professional musician says. "I can't get past the fact that we've elected somebody who deals with conflict by tweeting." After hearing what her daughters had to say, Ginger says she recently decided she's actually a Libertarian; all three agree they would have voted for Vermont Sen. Bernie Sanders. There's also agreement at a nearby table, where retired teacher Trudy Kirsch, 64, is eating lunch with her son John, 32. "I think he's doing great — absolutely wonderful," Kirsch says. "And if there was not a problem with people coming over illegally, we would not need the wall," Kirsch says. "But if it's broken, then we need to start looking at other options on how do you fix it." John Kirsch, who has owned and run a landscaping business for four years, agrees that Obamacare needs to go, saying that he has struggled with rising health insurance premiums. He also says he appreciated Trump's promise to cut taxes on small businesses and his quick executive action to cut regulations. "He's changing all the rules, and I love it"
At Anthony's Barbershop down the street, proprietor Anthony Orlandino is joking with a friend while he trims his hair. The 69-year-old has had his shop on Main Street for 14 years. "You know what he's got going for him — he's got Twitter going for him," Orlandino says. "Now he can actually put it out. 'Here's what I got — don't listen to the media, this is what I'm doing.' "
And Orlandino says he simply likes Trump's style. "He's a businessman, not a politician," he says. "Politicians have gotta talk from both sides of their mouth, gotta please everybody because they want votes. He don't have to. He's saying, listen, this is the way it's going to be. He's changing all the rules, and I love it." In the parking lot outside of a Meijer grocery store, a few cars have Obama bumper stickers on them. But Annette Jones, who's helping her granddaughter load groceries into the car, is a Republican who voted for Donald Trump — and she is, as she puts it, "ticked" about the executive order on travel restrictions. "I thought he was doing good until he stopped all these people from coming in, and had them all at the airport. And I think that's wrong," she says. "So now it's like ... wait and see, what else he's going to do." But Angela Fletcher, a 36-year-old social worker who also voted for Trump, says that executive order doesn't bother her at all. "I'm happy with him," she says. "I know that's not the popular answer, but I like it, and don't have any issues with things he's done so far, I guess." Fletcher, like many Trump voters in this small town, says she appreciates that the president is moving quickly to turn many of his campaign promises into policy.